Today, I made a colorful thank you card. I first sprayed some Lindy's Stamp Gang on my white cardstock. I didn't know what kind of background I wanted exactly so I just followed my feeling and used many colors of Irresistible inks to add more colors and dimension to my card. 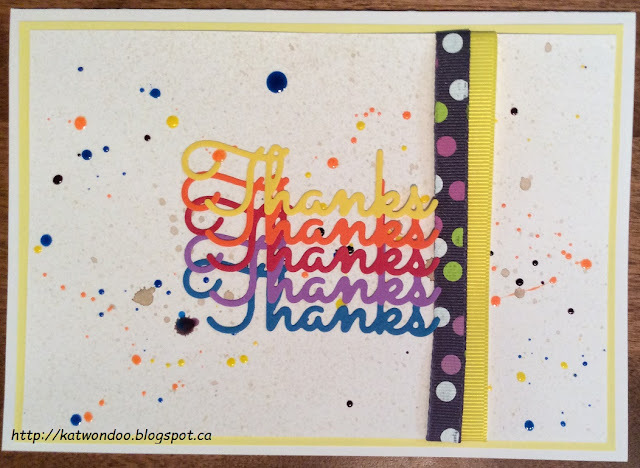 I made 5 die cut of the word thanks to make a rainbow effect and added 2 ribbons for more texture. - Impression Obsession: Splashes of color! A great rainbow design - and the ribbons play along so nicely with it! Thanks for joining us at the Simon Says Stamp Wednesday challenge! I love your multicolored sentiment. The layering is so creative. Thanks for playing in our challenge. I love the background and how you die cut the sentiment from different colors of cardstock. I need to try that. Wonderful.